What are we doing with our horses; is it serious work, structured training or free play? 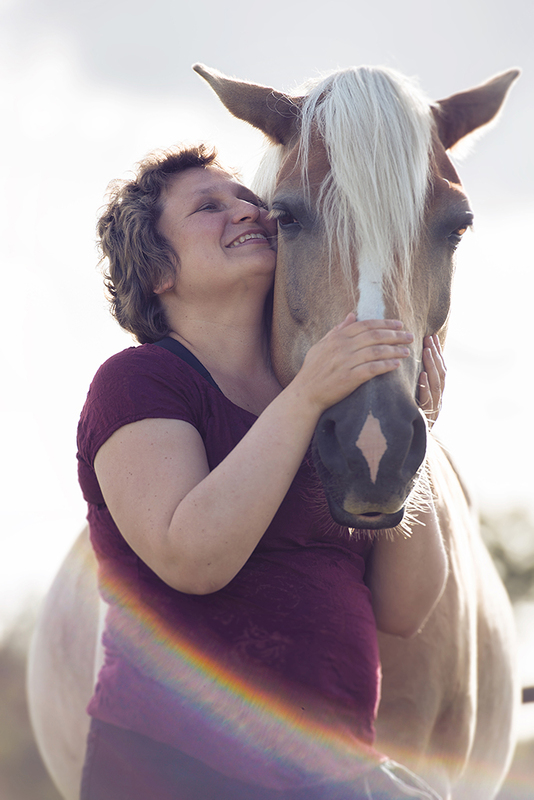 In any case, the key elements are our horse’s emotions and the way we feel. 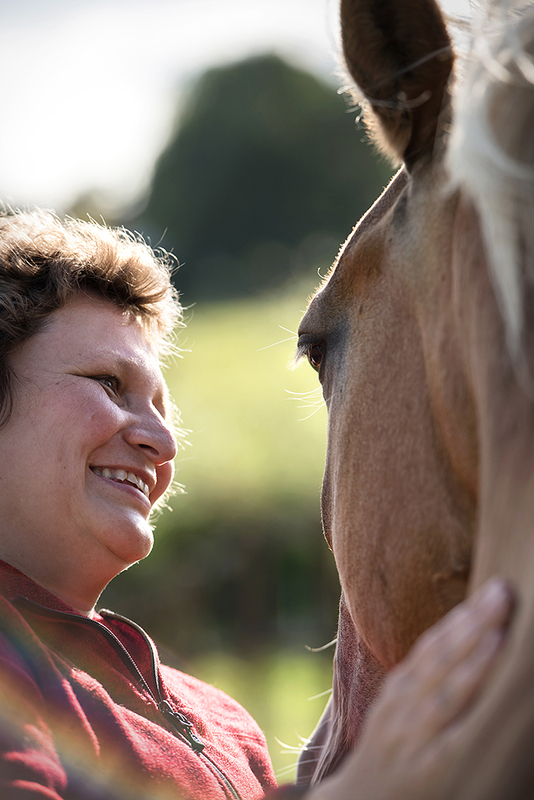 We do not want to show “the one and only way” but we want to celebrate diversity, and all the different perspectives each of us can contribute to enrich our life with horses. Being together with our horse is the best part of this pastime, and we can all shine in this discipline. The two of you is all that matters. What if the world will not appreciate my trainer skills? What if they laugh about me or prefer different methods? Well, the world is big and humanity is colorful and diverse. Not everyone will understand what you are doing, and look with affection. So, criticism is a valid concern. However, it is not about preventing criticism but about asking, “So, what”. It is not your task to become a global authority in horse training. Your task is to be yourself, and thereby become the best partner your horse could wish for. All you have to do is to discover yourself, and to open up for the other. 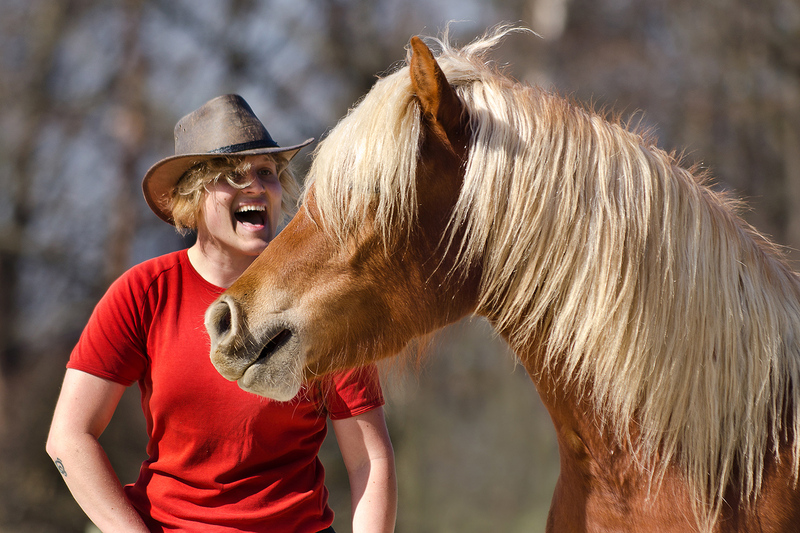 Show your feelings, spend time with your horse, and share your true thoughts. Admiration can be exhilarating but still remember that some will not understand what you are doing. What happens between you and your horse is meant for you. Oftentimes it will not have any special importance for anyone else. However, you still can be a source of inspiration for all of us. Depending on the definition we can imagine many different forms of training. 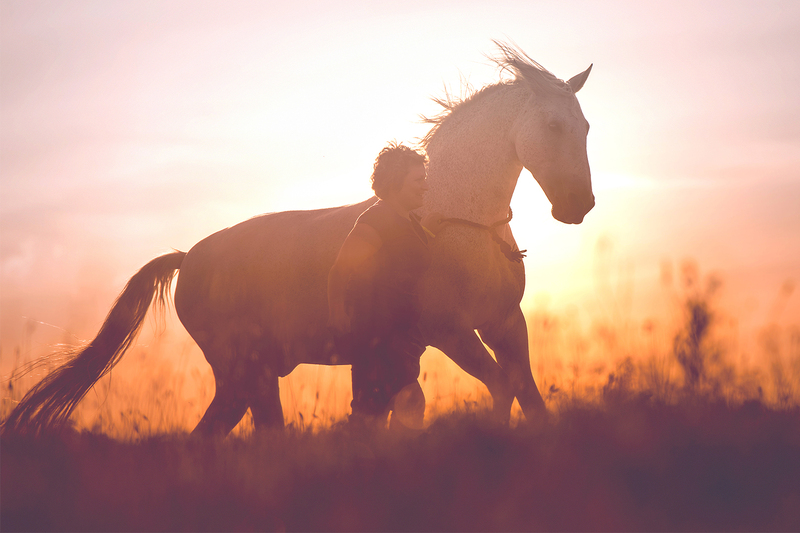 Learning is a constant process in humans and horses alike, and life means constant change. Therefore, which tasks to relegate and which ones to prefer is always a matter of taste and circumstance. For us, here at R+, it has proven successful to start with the most demanding challenges before doing anything else. So, what are these most demanding challenges? It is the matter or subject closest to your heart. It is about developing a basic idea about your relationship; it is about developing a relationship from the heart. This is a very fundamental process that enables feelings of satisfaction and happiness, humility, gratitude and appreciation. Furthermore, it makes you feel proud and frees you from chasing other people’s ideas or illusions of happiness. Just focus on what your heart tells you, listen to your wonderful four-legged friend’s heartbeat, experience the moment, and only then start doing something else. This comes before making plans, before getting the clicker out of the pocket, before cutting carrots, and before trying to influence your horse. The first step is always pure and fundamental being. What are your longings today? Many things resemble each other on a profound level. For example, it is possible to perform playful passages in a jumping style resembling a galloping foal. And it is possible for a horse to rear in a lesson with the same amount of force as it would use to perform Spanish walk. So, the core questions of many topics are: What am I feeling in a certain moment and what are the feelings I want to develop? It makes a difference whether we try to imagine a training session as goofy or elegant. So, we need to know our personalities well, and increase our awareness of the feelings locked in each moment in order to get to the root of the matter. In short, we need to get rid of our urges to show off, to put ourselves in a good light, and to prove ourselves. There is no space for aggression or degrading the other if we reflect upon these thoughts each time before we meet our horses. On the contrary, what arises from positive vibrations we feel in the heart is truly enriching and connects us. The following thought experiment can help to get there. It is important to play around with what is familiar in order to create something new. Why? Science has proven that we establish an inner image, a kind of visual memory, during the course of our life. There are so many images we receive from other people, and many of these images do not represent topics that are even close to these people’s hearts. We often know exactly what we like or dislike about others, and we are familiar with being critics. However, many of us have not developed images on our own for a long time. Oftentimes, we are not so familiar with being creators. We find it difficult sometimes to get in touch with our inner selves and to find our own and special relationship with our horse. Sometimes we desperately look for tasks that are achievable but still rewarding. Here they are: Clixi and Curly. Clixi carries a bag chock-full of treats. Curly is full of beans. The day is still young. Clixi holds the clicker in her hand. What next? She is without a clue. Her head is empty, and she cannot remember a single exercise to start. Not even a mini-exercise, pure nothingness. And here are all the other horse people. They are looking somewhat strangely: Why are Clixi and Curly only standing around? Why are there so many treats in the bag? Curly is fat enough…Clixi thinks: I need a plan… but what if it does not work straightaway? Don’t panic! We all know moments like these, and it is good to know some tricks: All of this is only about you, Clixi. It is about you and your wonderful horse Curly. Always remember: There is no stage, you are not an actor, and there is no crowd. You are just you, and that is enough. So, let us start with something ordinary. Can you touch your horse in a loving manner? Do it! If not, you can still watch and observe it without wanting to change anything. Let the atmosphere work its magic. And then start with something you have seen before. Do it your way; maybe your way is simpler, more playful or even more complex. You can also think of a category: For example, “all things related to things” or “I put my heart in my hand and in this touch”. 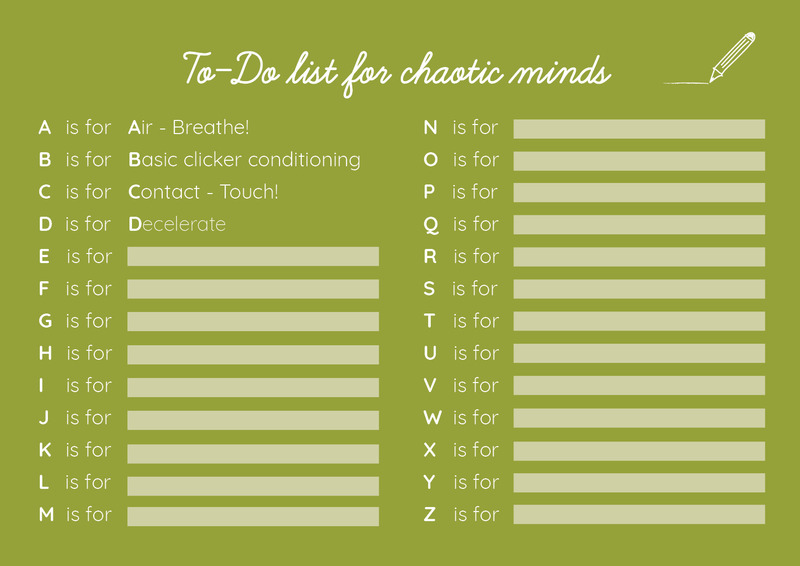 Furthermore, you can take an alphabetical approach as shown in the following example. This helps you to establish structure when your mind is stressed. Some training sessions will be successful, and others will not lead you where you intended to go. There is this certain kind of flow: Your horse starts to act in an inspiring way. The first click leads to the first treat but the lesson is not repeated because your horse already shows the next step towards your envisioned goal. This leads to the next click and a second treat. This could continue without end. Other times there is no flow at all: The first click was a bit disorganized; maybe it came too late or the treat was unfavorably positioned, or… Following this path would lead directly into chaos. Why did this happen? Well, leading training experts agree that there is one influential factor: It is luck. Sometimes everything fits, and other times nothing goes as planned. So, it is up to you to lovingly accept that luck has not been on your side this time. Yet, you can still contribute to create beautiful things out of random events. Happiness is not out there, it's in you. You can turn the events in any direction, and it is about turning them so that, sometimes when looking at your horse, you can ask yourself: Has this really been me? Did I really create and experience this moment? 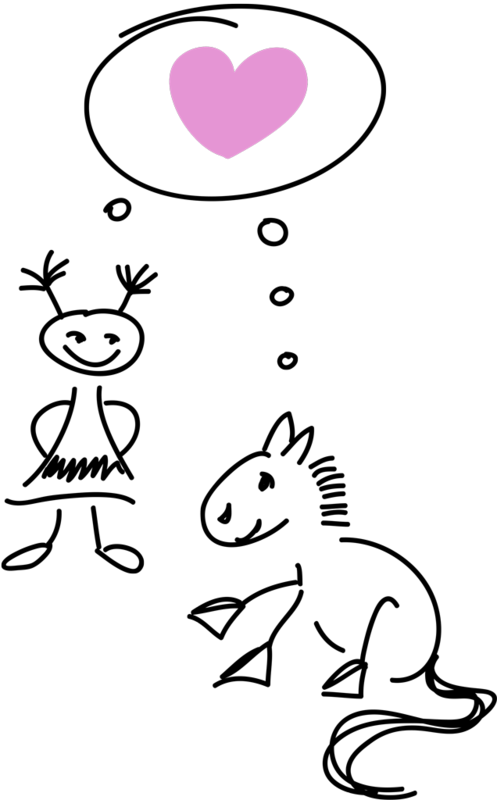 How did I achieve that? These moments and questions proof that you are following the path to find happiness together, and to discover what R+ means in its core: Choose to advance on the path of positive development. R+ is definitely about findings from behavior theory, psychology of learning, and training theory. Yet, the whole is greater than the sum of its parts, and R+ is equally about intuition, flow, and feelings. This is the Plus. We are not only interested in getting to know the rules and mechanics of positive reinforcement and in applying them but we want to include the meta-level as well. 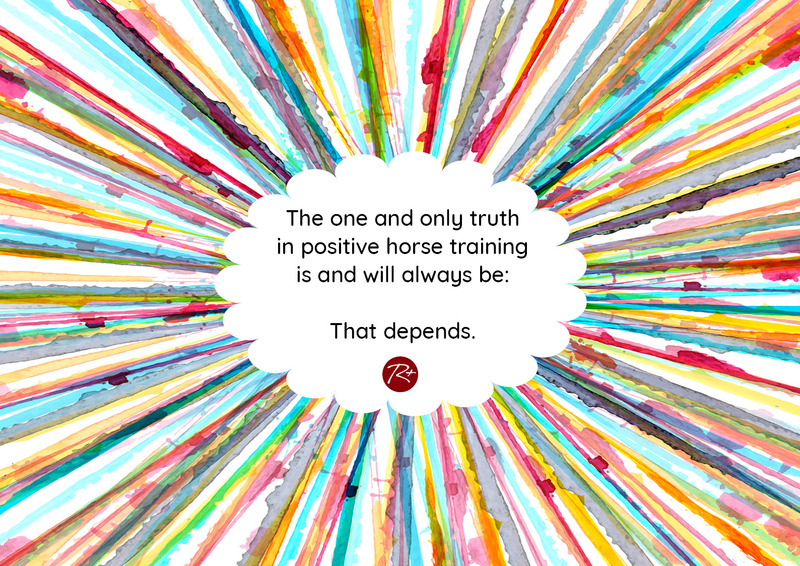 We want to know what a horse wants to tell us in a certain situation, and what we can learn from it. 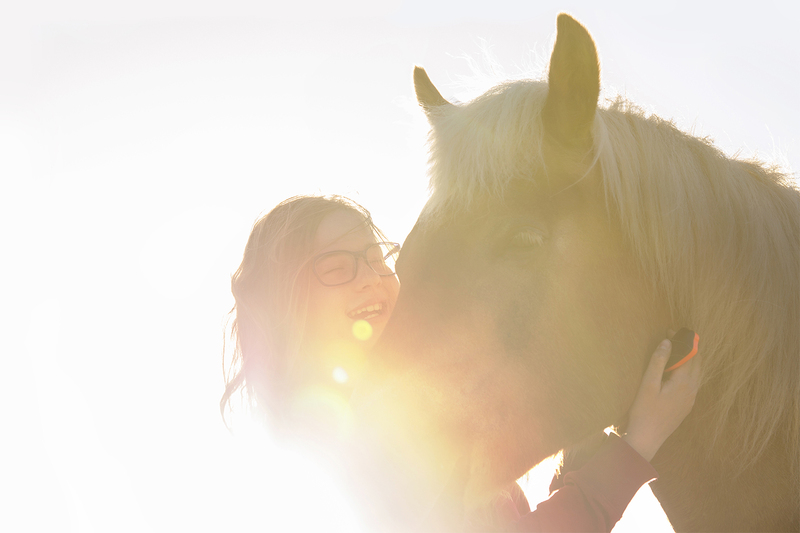 So, we want to provide a stage for the horse so it can enter into contact with us; a stage where it can show its true personality, its typical behavior, and where it can shine. We need a perspective that reflects the horse’s creativity, and its innate movements and expressive force. On a personal level, I do not gain anything from teaching a horse an arbitrary stereotypical interpretation of a standard lesson. I am not interested in creating another of the innumerable copies you can find online or at events that are able to perform, for instance, a well-trained but soulless Spanish walk. I want to find our own Spanish walk, and I do not want to form it according to a specific idea and fix it for all eternity. I want to dance our Spanish walk, let it become big and expressive, and sometimes more extensive, other times more playful so to reflect our mood. 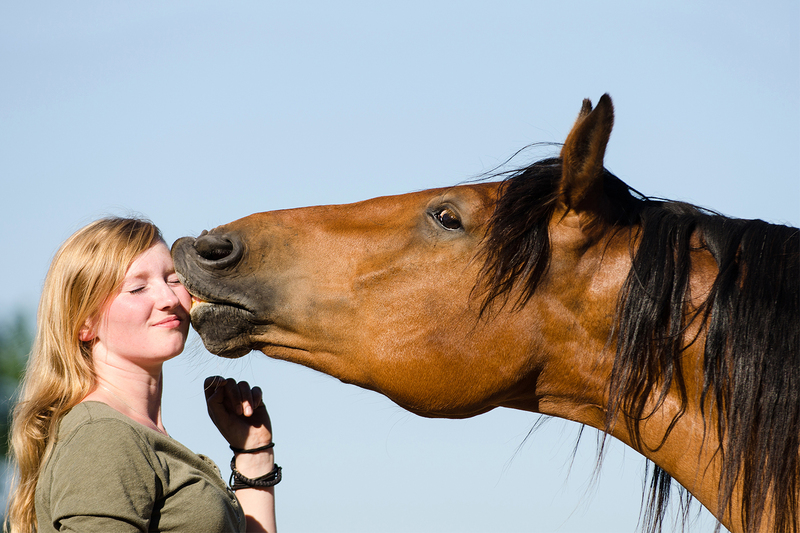 Horses communicate their emotions through movement. We deprive them of certain experiences and of many ways to express themselves if we teach them to correctly perform “basic tango steps”. 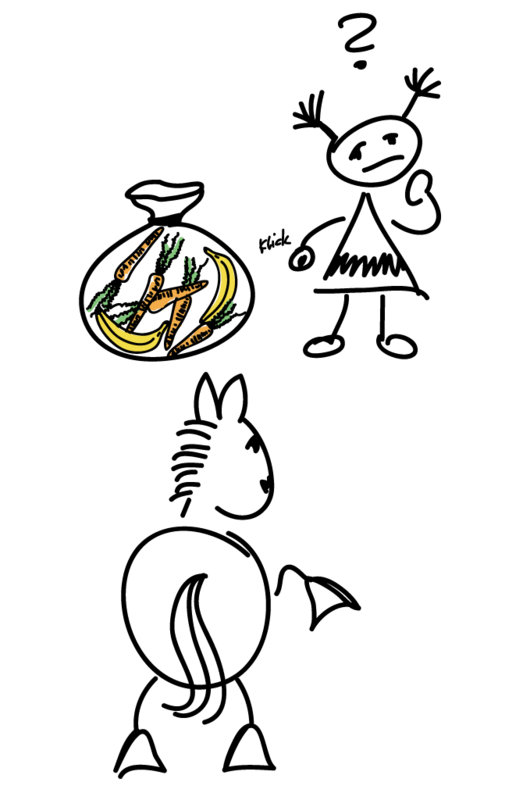 What is more, dancing tango only begins after finishing the groundwork when we start to experience the feeling of movement between two partners, and the invisible bond that connects two souls. Feeling emotions and intensively experiencing the moment is not enough, so, intuition comes into play. Neither animals nor humans can act from intellect alone, and we constantly use input from unconscious emotions to casually assess what to do in a certain moment. A strict set of rules might even hinder our ability to quickly decide what is best. We rather use high powers of observation, rapid implementation, and the ability to express ourselves at this level of communication. It is not enough for me to influence the behavior of horses, to educate them, and form them according to my likings. During the course of this process I want to change myself, and enter into a relationship. I have three horses, and you can watch me interact differently with each of them. We play specific games, use different means to express ourselves, and chose different paths. Harry, for example, is really extroverted, and likes to play. He learns new elements easily, and includes them in his existing repertoire. Furthermore, his agility offers many suggestions for new lessons. In contrast, the gentle Mausi is much more introverted. She makes a lot of eye contact and loves to talk with her eyes. Many times we do nothing but look each other in the eye before we start acting. Polly is yet another personality. She likes to direct the action, she decides about direction, pace, and topic because she can only shine when she is the center of attention. Then, she opens up, and is willing to learn new behavior, and try new things. She needs to know that she can decide to feel safe. 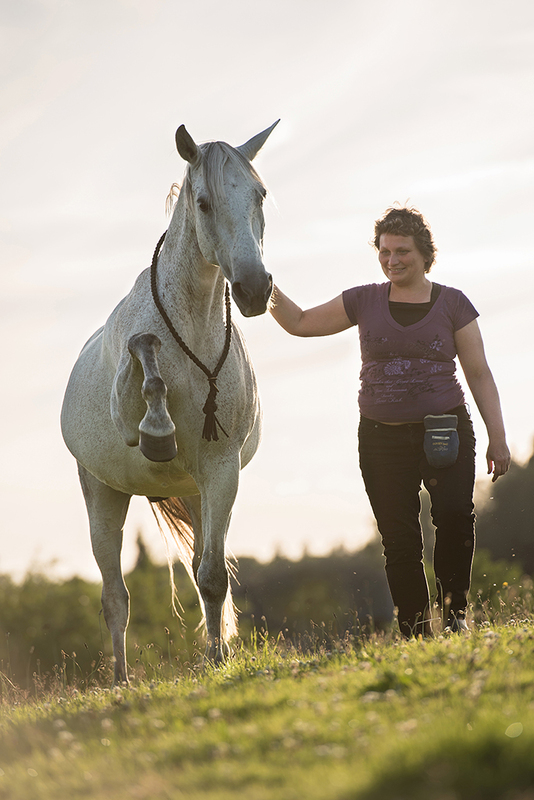 Being a good trainer in the sense of being horse-friendly and personality oriented, and acting accordingly, requires more than having high powers of observation from a human point of view. I really need to feel what the other perceives. Often, when working with other people’s horses, I can detect irregularities in motion sequences. Establishing academic plans to develop behavior that builds upon this irregularity does little to achieve the real objective in my opinion. Changing and regulating a horse’s natural ability to move is what really intrigues me, and I am not interested in going through exercises the horse cannot perform, or cannot perform properly, yet. There are so many highly elaborated piaffes that appear monotonous because there is something wrong with the motion sequence: wrong pace, wrong rhythm, or wrong height of leg movement. 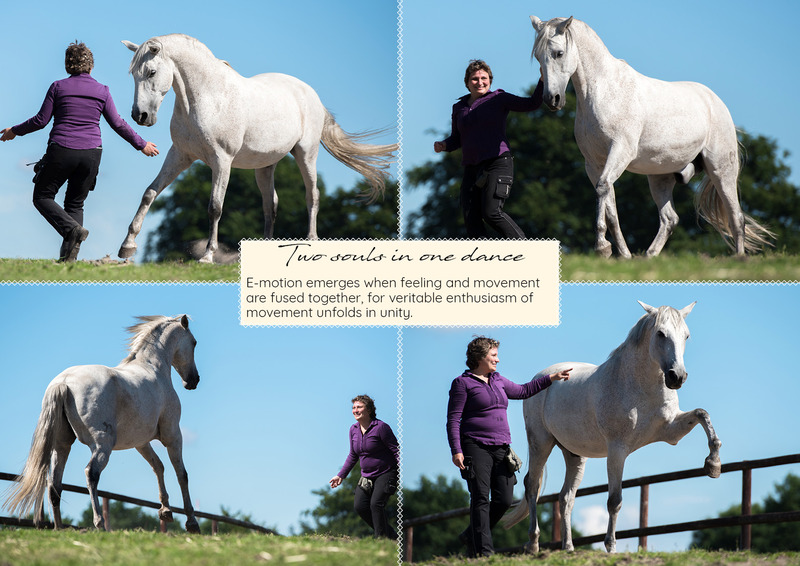 Such mechanically looking dressage lessons are not always the result of pressure-and-release based training methods but can also be found quite frequently in positive horse training. This happens especially if human trainers do not feel the horse’s movements, and start clicking with disregard of the horse’s body language and emotions. As a result, we will see robot-like, interchangeable behavior that does not enter a dialogue of movement and does not represent genuine personality. I cannot answer how I talk with horses by referring to certain signals or by pointing to a scholarly handbook. Personally, I would not want to train a horse to know, for example, one specific way of moving into canter after I give a certain hand signal. Such a horse would canter in the exact same speed, and with the same cadence and level of elevation every time. However, I want to train horses to be able to explosively jump upwards in full dynamic of movement as well as being able to move into a slow canter with little cadence. The way I perform a signal, my position to the horse, the kind of behavior shown before the signal, and many other factors influence how the horse and I will interpret a certain moment. We kind of agree on a topic, and move within its boundaries. We make suggestions and decide what can become a part of the topic, or how we might want change the topic. For example, Harry’s backward Spanish walk resulted from such a dialogue of movement within a single lesson. I just followed my intuition, and even though I had not had planned to teach this exercise that day, it just happened. Horses are experts in perceiving intuitively. They, and ultimately humans as well, perceive within split seconds much more than can be processed consciously. Both species have a barrier that separates the conscious from the unconscious, and all that belongs to the unconscious is what, for me, differentiates a technically and theoretically educated horse trainer from an intuitively gifted horse-person. I try to leave the conscious level of rational thinking and planning as often as possible when I am with horses. This is always possible if I do not work on basic educational exercises or try to teach the fundamental principles of a specific training method. By leaving the conscious level I make space to feel the mood and atmosphere, and so the horse is given an opportunity to tell me something about its actions. For all of us, life unfolds at different speeds at different times. It is good to feel the pace, and to orient the speed of your walk accordingly. It will be difficult to establish any form of human-horse unity if you are sneaking around while your and your horse’s natures demand a faster pace. It is equally difficult to act in unison if you are a step ahead, and your horse is falling behind. Furthermore, it is important to adjust the pace of learning to match your speed of creative activity, and to suit your creative nature in general. An intense focus on specific parts of your horse’s body, on training schedules and on visualizing specific lessons draws the focus away from your wonderful horse-counterpart. And eventually, your focus on working hard will transform training into hard work. Do you sometimes think you are almost there but a tiny step is missing to reach perfection? Maybe you are there already, and this final step is nothing but the free space where you can find and be yourselves.